Teague Park students strung 100 fruit loops into a necklace, arranged 100 bottle caps onto a large chart, and made a domino track with 100 pieces on Feb. 6, celebrating 100 days of education, with some even dressing up as centenarians for the occasion. 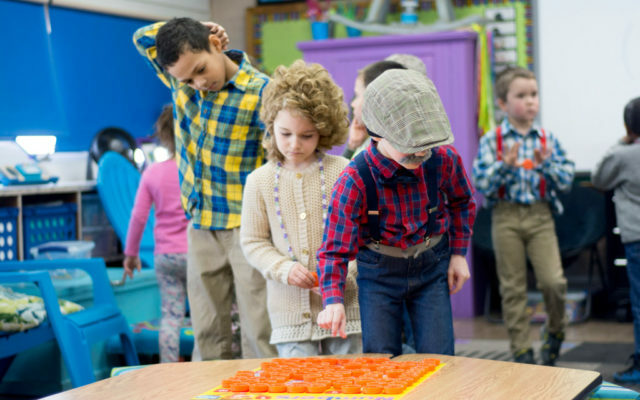 CARIBOU, Maine — Teague Park students strung 100 fruit loops into a necklace, arranged 100 bottle caps onto a large chart, and made a domino track with 100 pieces on Feb. 6, celebrating 100 days of education, with some even dressing up as centenarians for the occasion. 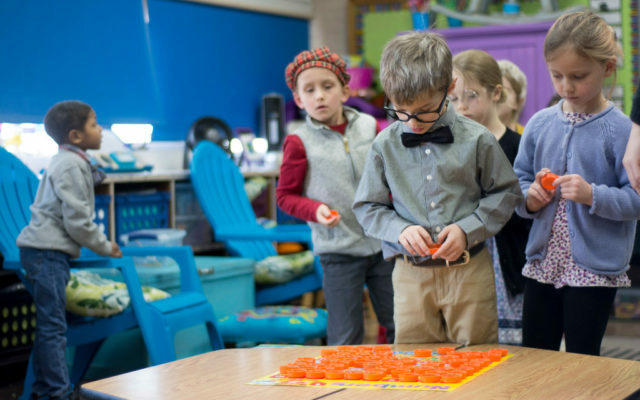 Kindergarten teacher Jennifer Poitras said the 100th-day festivities have been part of the school for decades, and that the tradition is not only an opportunity for young students to be proud of their 100th day of school, but to show that they’ve learned to count to 100 as well. Poitras said that counting to 100 is a “kindergarten standard,” and a tradition in the school for as long as she can remember. In April Belyea’s kindergarten class next door, students made a large chart out of numbers counting up to 100, attempted to stack up a tower of 100 cups, and wrote about what it would be like to be 100 years old. Kindergartener Corey Cote said he felt good about his 100th day, and that he thought the activities were fun. Cote’s classmate Morgan Donovan brought 100 pom poms to class, and “dressed up like an old lady” for the occasion. In her 100 days of school, Donovan said she learned “not to walk up the slide,” “how we can’t pull the chair back when we’re sitting in it or else it will fall” and “doing the pledge of allegiance,” in addition to learning how to count up to 100.